As you all know by now, our first chicken became hurt a couple weeks ago. Immediately we dubbed her Lady Sybil, as was keeping with our theme of "The Chickens of Downton Abbey." 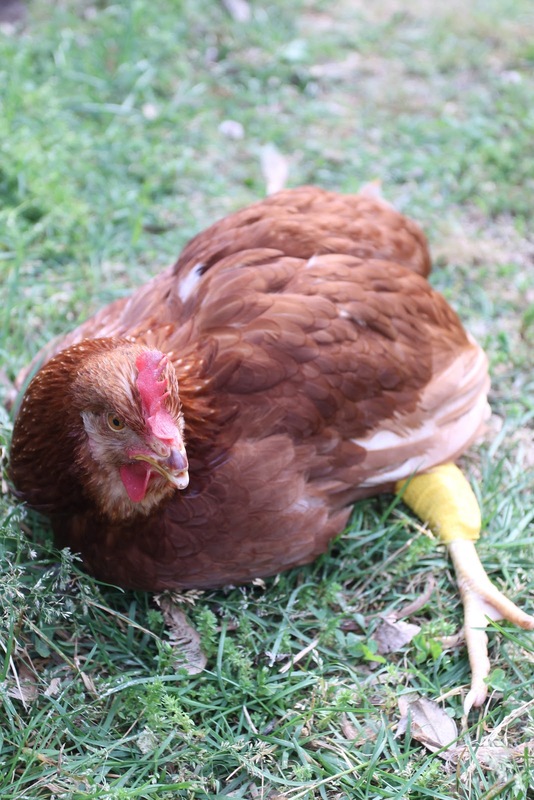 Last week, we had to face facts that perhaps Sybil wasn't going to bounce back from her leg injury. And let me tell you, my husband tried everything he could have to help her recover. When we realized she wasn't really eating, well, that was the tell-tale sign that she was on her way out. So we decided that if she made it through the weekend unchanged in her condition or worse, that it was going to be inevitable that we put her out of her misery. I, of course, thought that we should eat her...but I was convinced otherwise because 1) she wasn't eating and was practically bones and 2) it was a lot of work and finally 3) it was Sybil...our Sybil and the killing of Sybil was hard enough. My husband and I talked it over and we knew that she would probably need to be killed...but neither of us had the heart to do it ourselves. So we called up my father-in-law and asked him if he would do us the courtesy. He obliged, and we were grateful. My husband sharpened the knife, dug the hole, and we steeled our resolve. We spoke briefly of drowning her, but decided that would be a little too dramatic. And not quick enough. My husband fed her some grapes, which she barely ate, and we petted her and told her she was a good chicken. We felt genuinely sorry that we had to do it. Nonetheless, we had to do it. She was suffering. My father-in-law came and he did it quickly. Sybil never saw it coming. And so it is that we have lost the first in our flock. We are down to nine chickens and the saga of Lady Sybil is now concluded. Oscar got his cage back that he had donated to her as the chicken infirmary. Life goes on much as normal around the farm on the heels of this hard decision. But it's part of the task in owning chickens. Rest in peace, Lady Sybil. You were a good chicken, and we loved you. Thanks. We are glad we didn't let her suffering continue. I Made Homemade English Muffins!!! Cherry Cake Muffins & Cherry Limeade! Rose & Mint Sun Tea!